© Ross E Smith Memorabilia – PO Box 353 ERINDALE ACT 2903 Ph: 02/6292 1266 – reproduced on this site with the kind permission of the author. All rights reserved. No part of this book may be reproduced or transmitted in any form or by any means, electronic or mechanical, including photocopying, recording or by any information storage and retrieval system, without prior permission in writing from the author. 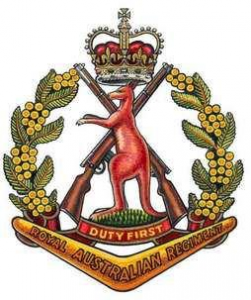 In 1966, the Australian Government announced that 5 RAR was to serve in South Vietnam, as one of the two battalions of the 1st Australian Task Force (1ATF). After an intensive training period 5 RAR marched through the streets of Sydney on 21st April 1966 and departed by air and HMAS SYDNEY for South Vietnam. The Battalion had the first National Servicemen ever to serve overseas in a theatre of war. After landing at Vung Tau beach, in-country training preceded the first operation. In Operation Hardihood, which began on 24th May 1966 5 RAR cleared and secured the area known as Nui Dat, the site of the 1 ATF Base Area. The Battalion was under the command of 173rd Airborne Brigade (US) during this operation. During the first tour of active service 5 RAR participated on 31 operations. Nine cordon and search operations were also conducted by the Battalion in villages in Phouc Tuy Province, the battalion developing techniques in this type of operation that were to be accepted and used throughout the Australian Army. An additional seven operations of company size were undertaken with 6 RAR. Awards for gallantry earned in 1966-67 included one DSO, three MCs, two MMs, one BEM and 19 MIDs. Casualties suffered by the Battalion were 25 killed and 79 wounded. 5 RAR established a comfortable base camp in the Ap An Phu rubber plantation at Nui Dat, naming most of the roads after soldiers killed in action. The Battalion handed the camp over to a 7 RAR before returning to a tumultuous welcome in Sydney on 12th March 1967. During 1969-70, 5 RAR was faced with a different type of war from that met on the first tour of active service in Vietnam. This year was characterised by continuous battle with North Vietnamese and VC enemy entrenched in bunkers. In excess of 10,000 bunkers were located and destroyed during the year. Some 2,000 of those located had been occupied by an enemy armed with rocket propelled grenades, claymores and AK 47 automatic rifles. The year was also marked by the ‘mine battle’. Over 100 casualties were suffered by 5 RAR on enemy planted mines, especially M16 in the Dat Do and Long Hai areas. Almost four months were spent on operations outside of PhoucTuyProvince in Bien Hoa, Long Khanh and Binh Tuy. Some of the most successful operations were conducted in the northern Hat Dich area where over 100 enemy main force soldiers, mainly of 274 Regiment, were killed. Other notable operations were the capture of Military Region 7 HQ in April 1969 in Long Khanh, and the Battle of Binh Ba against a battalion of 33 Regiment in June 1969. ‘D’ Company 5 RAR played a leading role in both of these actions. Pacification operations were undertaken for one month in June-July 1969 around the town of Dat Do and ‘B’ Company trained an ARVN battalion on the Horseshoe feature in August 1969. The Battalion killed 353 enemy and captured large quantities of arms. 5 RAR suffered 25 soldiers killed and 250 wounded. Awards to the Battalion for this period include one DSO, three MCs, two DCMs, three MMs and 10 MIDs. The Battalion was once again welcomed home by a memorable reception during a march through Sydney on 12th March 1970. 5 RAR was linked with 7 RAR at Tobruk Lines, Holsworthy on 3rd December 1973 to form 5/7 RAR.